Sled dogs are outdoor dogs. Most sled dogs have their own ‘house and circle’. 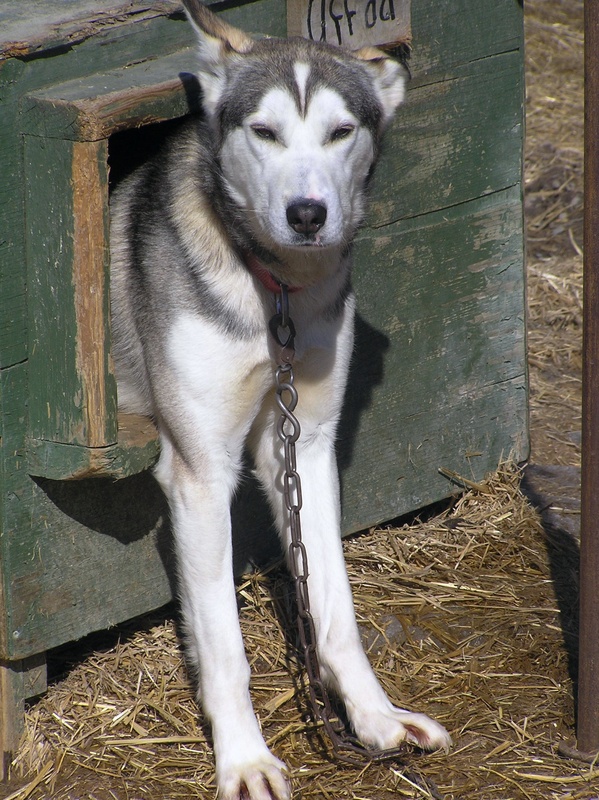 Most mushers keep each dog attached to a tether pole located next to a dog house. Each dog has it’s own house and ‘circle’. Ample water and food are provided for each dog. The circle is ‘scooped’ and cleaned on a regular basis. The circle is the area that a dog runs around while attached to the tether pole. The tether may be 5 or 6 feet long, which allows for ample running and exercising in a circle around the dog’s house. The length of the tether allows the dogs to interact with ‘neighboring’ dogs. The tether is just the right length so the dog can easily go in and out of the dog house, too. The dog’s house should be a little snug so that when lined with an insulating layer of straw, the dog is comfortable and able to stay warm. If the house is too large, if there happens to be a higher ceilings or wasted space inside the house, too much of the dog’s own body heat would be needed to keep the dwelling warm. The mushers make sure that the dog’s house is just the right size to keep a sled dog safe in winter’s elements.